Heaven and hell…black and white…ice and fire, the Old Quarter and the Temple, Dinh Co Vu. Total and utter opposites. ​Narrow streets boisterous shops, noisy street merchants, scooters and bikes in every direction all the time. Friends yelling greetings to be heard over the noise. A high wall, a very small gate, a giant tree signals respite quickly through the gate and into an almost ethereal peace only one meter away from the world exploding. 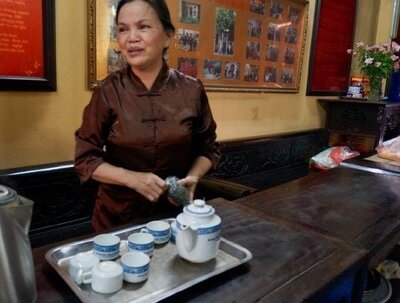 ​Small Buddhist temples pepper the streets of Hanoi. They’re open and everyone is welcome with hats off and mouth closed to come in and exhale. The soft wafting of incense, the quiet glitter of old gold and Buddha looking down on you as puzzled as you are looking up and down. ​Here is the key decision point: to sit and rest and think or to scurry out and rejoin three day tours. We stayed. 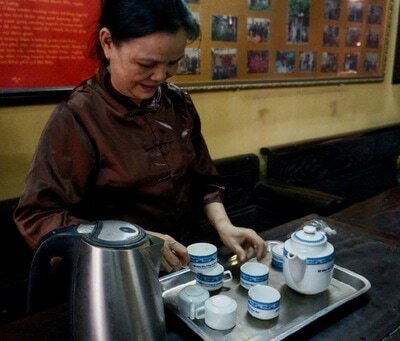 A wonderful old lady beckoned us over at a table to sit and have tea. A friend joined her and chatted away in old broken french picking away at our meaning. A young german woman poked her nose in, peeked around and was captured by our lady for a sip of tea. The 5 of us sat and chatted in a maelstrom of languages but in low voices and warm smiles. The twitters of the street leaked away. It's possible Buddha grinned. Everyone talked about this city or that as a place of contrast but that one meter wall between the street and the Temple is the greatest single contrast we’ve ever seen between the skyrocket of experience and the ultra calm of the small temple. 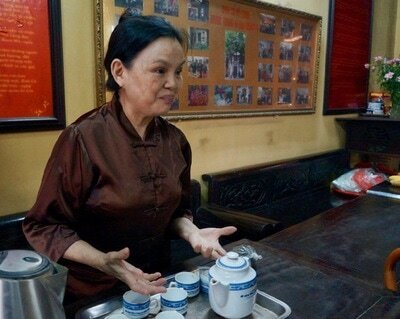 ​Dinh Co Vu is in 85 Hang Gai Street, a busy shopping area in the Old Quarter of Hanoi. When you see the old Cay Da tree on the street, that is where the Temple is.